Work place injuries in a Retail Food Industry are common and range from a small cut requiring a Band-Aid to something very serious requiring hospitalization and even surgery. Knowing what to do early in the process can save you some headaches or your job later down the road. Getting the care that you deserve early can make a difference in your recovery and sometimes in saving your job. When you are injured on the job, you are required to report the injury to management immediately. Management is required to fill out an accident report which may include the nature of the injury (slip and fall, cut, etc. ), date, time, witnesses and a description of exactly what you were doing when the accident occurred. Should the injured member require immediate care, then you will be sent to or transported to an authorized clinic or hospital nearby your worksite. In most cases, this is done while you are still on the clock. It should also be noted that most Employers are allowed to perform post-accident drug testing. 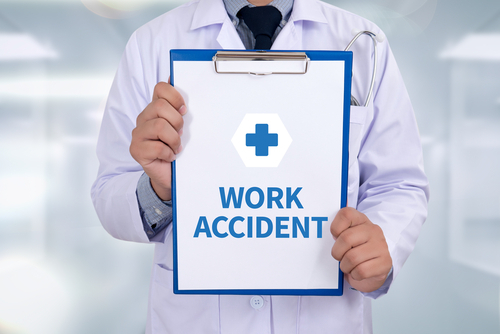 This is usually requested shortly after the employee reports the injury and requests treatment and performed at the doctor’s office or industrial clinic. Some injuries are caused by repetitive movement. You may experience a repetitive strain injury caused by the constant repetition of some work functions. These repetitive motions involve tasks that include a lot of heavy lifting, bending, turning, kneeling, twisting, posture and continuous stress on certain muscles producing localized muscle fatigue, just to name a few. When you experience an injury caused by repetitive movements as described in the previous paragraph, you should still report the injury and fill out an accident report. Evan though you may not be able to give an exact time and date when the injury occurred, report that your injury is a result of “repetitive movement” that you experienced on the job and request to see a doctor. An injury or accident on the job is fully paid for by your employer. A mistake that many members make is to see their own doctor for treatment , never reporting the injury to management, and later finding out that their injury requires work accommodation’s or surgery. There could be financial obligations to the member for a work related injury that was improperly paid for by your health insurance. Not to mention co-payments for doctors visits, medical devices and prescription costs that were paid by you. The employer’s insurance carrier would have paid all those expenses for an approved claim. Your employer may dispute some of these injuries, especially when you cannot point out a specific time or date that the accident occurred. In these cases, you may require the assistance of a Workers Compensation Attorney. Your Union Representative can assist you by referring you to one of the experienced attorneys that have helped our members in the past. These attorneys do not work for the Union, but have represented a great deal of our members with a good track record of success. They will not charge you to discuss your case, and will give you advice on the best course of action. Your contract has protection for injured workers that need to take time off work due to a work related injury. These leaves of absences are greater in length than a leave that is for an illness. Evan though you have more time to get better due to a longer leave, the time off needs to managed wisely. A great deal of time can be wasted waiting for doctors’ appointments and surgical appointments. It is important to manage your time and get the treatment that you need early. If you believe that your injury is serious and you are not getting the proper treatment in a timely manner, you may need advice from an attorney. Please do not hesitate to call your Union Rep. to assist you in the process and to make sure that your rights are not being violated.